SAN FRANCISCO (CN) — Despite objections from dissatisfied drivers, a federal judge Thursday said he would grant final approval to a $27 million settlement for roughly 163,000 former and current California Lyft drivers. 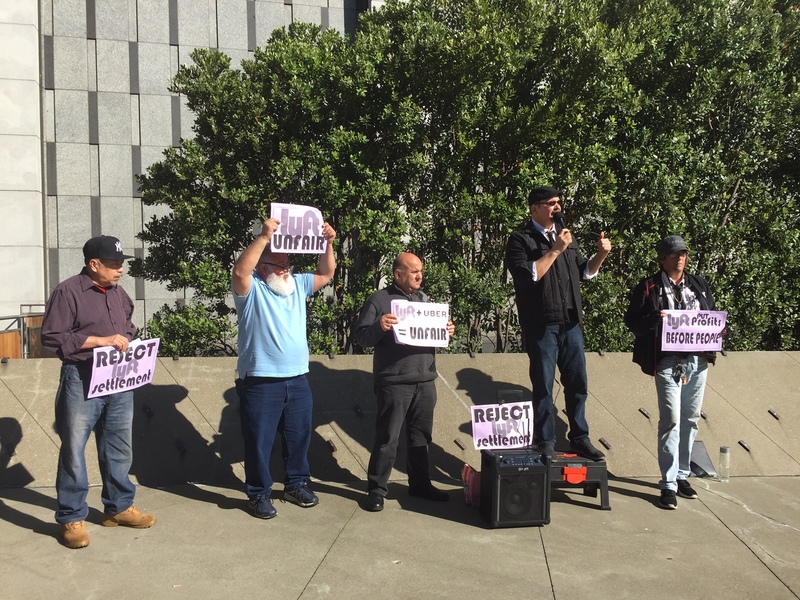 During a Thursday hearing, U.S. District Judge Vince Chhabria declined to hear objections raised at a December hearing by the Uber Lyft Teamsters Ride Share Alliance, or ULTRA. The Teamsters argued that the settlement failed to adequately compensate full-time drivers and forced workers to waive their rights to sue for violations of the Fair Labor Standards Act. Chhabria said he would address those objections in his final settlement order. Class attorney Shannon Liss-Riordan said 95,000 claims were filed. She said part-time drivers would receive $1 to $2 per hour for each hour they worked in ride mode, and full-time drivers would get $2 to $4 per hour for each hour in ride mode. “People who have driven the most will get thousands of dollars, which is a pretty fair deal,” Liss-Riordan said. The class includes all Lyft drivers who gave rides to passengers in California between May 25, 2012 and July 1, 2016. Class counsel also requested $3.68 million in attorneys’ fees, less than 14 percent of the settlement amount. Outside the courthouse, a small group of Lyft drivers railed against the settlement, saying such deals allow companies like Lyft and Uber to take advantage of workers classified as independent contractors and to pay less than minimum wage. San Francisco native and Lyft driver Edward Escobar called the $27 million deal “a slap on the hand” for Lyft, saying some drivers have to sleep in their cars to earn an insulting $1.50 per ride in one of the most expensive cities in the nation. “This kind of behavior, of putting corporate profits ahead of people, is unacceptable,” Escobar said, speaking through a megaphone in front of the courthouse. Liss-Riordan said she understands that some people are upset class attorneys did not press claims that Lyft improperly classifies drivers as contractors and denies them employment benefits. But she said she had to weigh the $27 million offer against risks of litigation. In September last year, the Ninth Circuit reversed a ruling on Uber’s arbitration agreements, upending a potential $100 million settlement with Uber over similar claims of misclassifying drivers as contractors and violating labor laws. Liss-Riordan said that “unfortunately” the U.S. Supreme Court has allowed corporations to elude labor class actions by using arbitration agreements, which require workers to waive their rights to seek justice through courts or participate in class actions. The Supreme Court in January agreed to take up the issue of whether employers can force workers to sign arbitration agreements as a condition of employment. That dispute was raised in three cases: two in which appeals courts ruled such agreements unenforceable and a third in which an appeals court in New Orleans found the arbitration clauses valid. With the late Justice Antonin Scalia’s seat still vacant, Liss-Riordan said, she expects that dispute will result in a 4-4 split — unless President Donald Trump’s Supreme Court pick, Neil Gorsuch, wins Senate approval before the case is decided. Liss-Riordan said California Lyft drivers can still submit claims to obtain settlement funds, but the opportunity to file claims will end soon. Lyft drivers may file a claim or find more information at www.lyftdriverlawsuit.com.